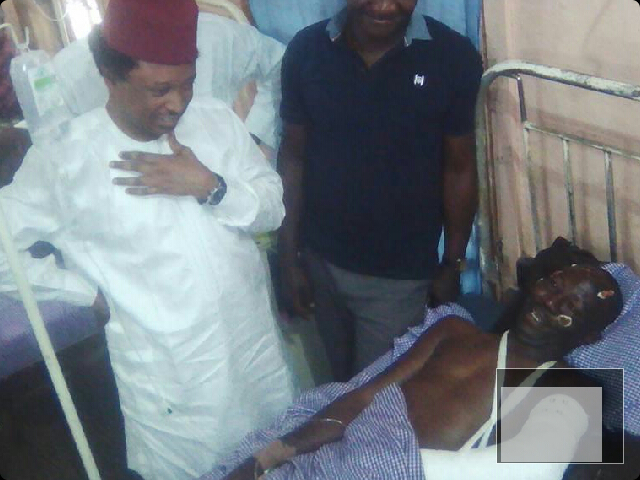 Following the last Mondays road accident that involved a Correspondent of People’s Daily Newspaper in Kaduna, Mr Femi Oyelola, and his subsequent admission at Saint Gerald catholic Hospital, Kaduna, Senator representing Kaduna Central and Chairman House Committee on Foreign and Domestic Debts, Senator Shehu Sani, had visited him on his safety bed and donated N100,000 cash for his immediate upkeep. Mr Oyelola was on his way to an official assignment at Ngwan Romi when he was knocked down by a fast-moving vehicle who ignored traffic rules. He sustained severe injuries and multiple-fractures after the accident. Senator Sani, who personately drove from Abuja to Kaduna to see the affected journalist, also told the management of the Hospital to transfer him to a special ward for proper attention just as he promised to off-set the likely medical bills after his discharge. Senator Sani described Oyelola as a hardworking and refined journalists that should not be abandoned during this trying period of his career. According to him, “in all societies across the world, journalists are special people that require special treatment considering the role they play as bridge builders. “That was why even when I was not formally informed about the unfortunate accident but saw it on Facebook and I believe as a journalist, I had no option but to visit him and see to it that he’s been properly taken care of,” he said. Earlier, the Senator had also freed another young patient, who has been ‘detained’ by the Hospital’s management due to his parents inability to balance the bills running into about N300,000. Other patients at Oyelola’s ward also got attention of the Senator who promised to assist in their various bills.